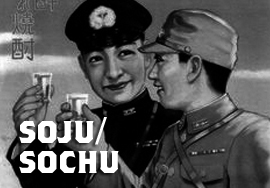 Buy Soju Online- Buy Korean Soju, Jinro Soju and More. This all too often overlooked spirit comes to us from Korea (although not all Soju is Korean Soju). Soju is traditionally made with rice and could be compared to vodka in that it is clear and rather neutral in flavor. That doesn't mean it's flavorless- far from it. The increased sugars in rice make this slightly sweeter and "meatier" than vodka and even when distilled at higher proofs, the efect is a smooth, well balanced drink. So whether you're drinking it neat, making a traditional kojinkamrae, portmanteau or poktanju, pick up a small bottle and give Soju a try. Gold Award at the 2004 Monde Selection.